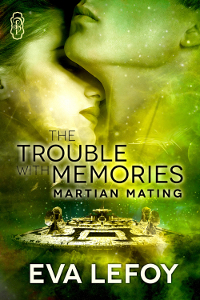 I’m currently organising a blog tour for Eva Lefoy with her science fiction romance novella, The Trouble with Memories. Lieutenant Lucy Borasco has her phase pistol ready and her ex-boyfriend in her sights. She has every intention of making him pay for choosing his career over her. But she hadn’t factored in a Martian sneak invasion, Cal’s incessant need to save the universe, or the risk of permanent damage to her complexion. Getting Cal back will cost her more than she thinks, leaving her changed forever. Captain California Sykes’ memories are gone, his career is in ruins, and his ex-girlfriend nearly kills him with a kiss. Can he overcome the Martian invasion, save the rest of the team and win Lucy back again in the process? Or will his seat-of-the-pants plans and the canned fish rations cost him everything he holds dear, including his sanity? The Trouble with Memories was released by Decadent Publishing on 17th January. The tour runs from 3rd – 7th March (weekdays only). I’m looking for five blogs which will host guest blogs or interviews. If you’d like to host Eva, please drop an email to writermarketingservices@gmail.com with dates that you have available (please check the below list first), as well as the name and URL of your blog/site. I’ll be filling these spaces on a first come, first served basis so get in there quickly!